Learn the kana in a fun way using games! When learning hiragana, you probably end up thinking "Now I've got to memorise all these funny squiggles!" This can feel like an uphill challenge, and it would be good if you could find a fun way to check by yourself whether you remember the characters having practised writing them, don't you think? 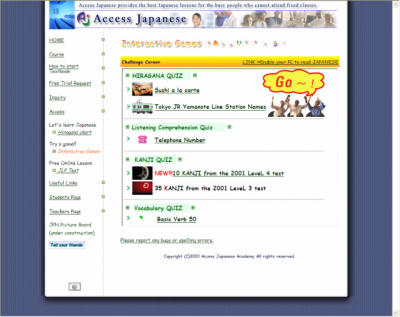 Well, you can try taking a game-style Hiragana Quiz on the Access Japanese site. 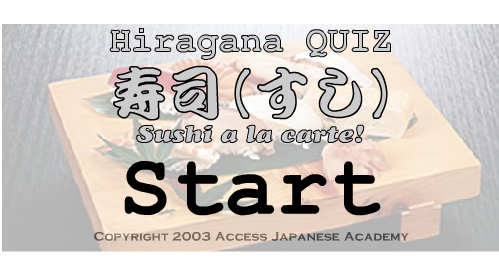 Here you'll find quizzes (Introduction article) to see how well you can read the hiragana for various sushi toppings and station names on Tokyo's Yamanote Train Line. Let's take a look! Below is the game contents' top screen. 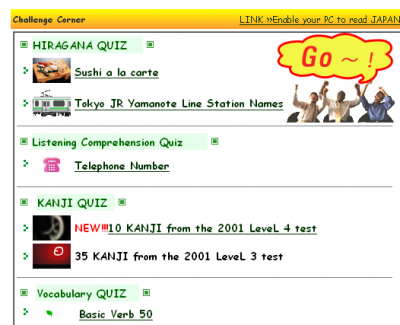 Right at the top you'll find the 'Hiragana Quiz' section. 'Sushi a la carte' is a quiz to see how well you can read the Japanese for different sushi toppings. There are 10 questions in total. The content of the questions doesn't change, so try again and again and who knows what'll happen?! ... Well, alongside the hiragana practice you'll get, you'll also be sure to remember 10 kinds of sushi, hey!? In short... If you know hiragana and katakana, your daily life in Japan will become easier and more fulfilling. Katakana ( contents of Leeのきょうざいかん ), especially, is often used on the menus of restaurants. Once you master hiragana in a fun way, please do your best to learn the katakana too. You can also easily try a basic verbs quiz and a listening quiz on the site. For people who want to study just a little Japanese, those who want a quick review method or those who just want to try studying with some games for a change of pace, this is a really useful place to start.